There are few things in this world that can match the pleasure of having a smoky grilled steak with a frosty beer on a hot Sunday afternoon. Those who have tried it will vouch for this fact. On the other hand if beer and steak are not your thing, grilled chicken is absolutely delicious, and the tastiest hamburgers are made by grilling. Bottom line is, if you like good food and you can cook, then there is absolutely no reason why you should not have a grill at your home. Because grilling is not only a method of cooking food but it is also a fun and relaxing activity. For the uninitiated, while there are a few different types of grills like gas grills, charcoal grills and infrared grills, the ones used most often are the charcoal grills. This is due to a variety of reasons. Cooking food on a charcoal grill gives the meat a great flavour, especially if it is something that is cooked slowly and has time to absorb the flavour from the smoke. Charcoal grills also burn hotter than the small gas grills (the bigger ones used by restaurants are entirely different), and finally since gas grills are more complex, they are considerably costlier than charcoal grills. The one downside or charcoal grills is that they are slightly hard to use for the beginner, but with a little practice, they are easy to handle. Next is the question of how to buy the grill best suited to your needs. The grills in the market range from a price of a few hundred bucks to more than one thousand dollars and unless you know what you need, chances are you will either end up overspending or get something cheap that you will find a pain to use. So finding out what kind of grill you need is the first order of business. Grilling can be sued to cook anything from a vegetable to a steak, so you need to ask yourself what kind of food you will be cooking the most and in what quantity. This will help you decide the size of your grill. 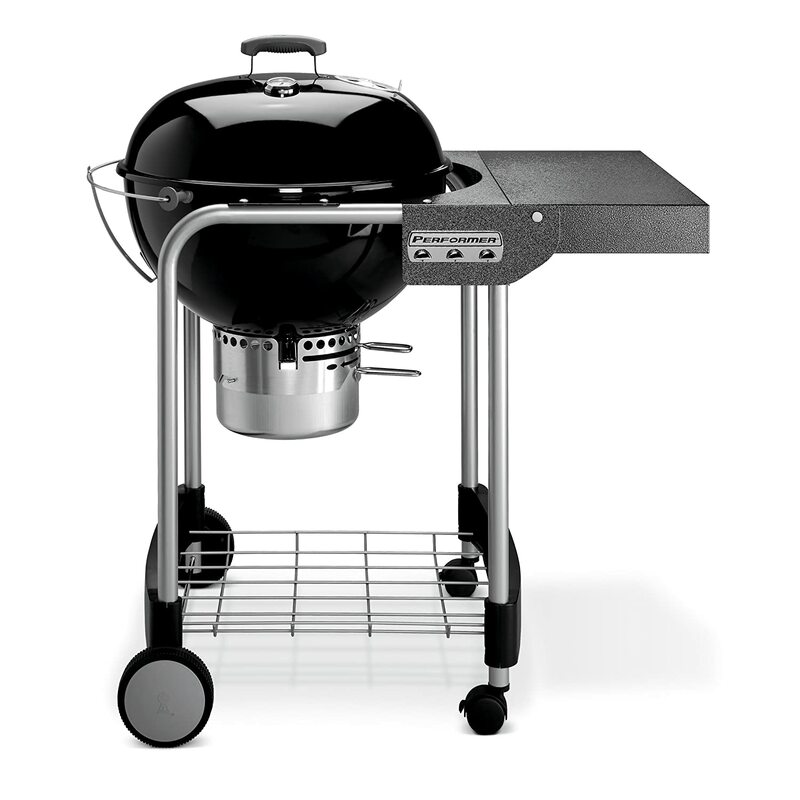 For the average user, a grill with a 300 square inch of cooking space can be sufficient. While looking at the size, also make sure you keep in mind the size of the lid, just incase you want to grill a whole chicken or something like that. Next you need to consider the body of the grill and what material it is made of. It is of utmost important that the grill be of a sturdy construction, so that it does not wobble when the fuel inside is moved around. The best grills are made of high quality stainless steel, or similar rust proof materials. Rust proof materials are important because grills are often exposed to the elements and can get rusted, which is obviously something undesirable. Besides this one needs to check out the extras. Grills can have hinged grates that allow adding fuel without having to remove the entire grate. They can have inbuilt thermometers to keep a check on the temperature. Built in counters and utensil holders make for extra space to keep your plates and spatulas. Putting it together at home is a piece of cake and is almost like fun little project. Furthermore it has all the basic necessities that make using it so convenient, like the utensil hooks, a plated hinged grate that folds sideways to access the fuel while cooking, a good sized aluminum ash tray that is easy to remove and a very useful and sturdy side table made out of stainless steel that can bear up to 20 pounds of weight. The total cooking area is 363 square inches which is more than sufficient for a family barbeque. The bowl is porcelain enameled and looks stylish. The handle on the lid is made out of glass reinforced nylon which means you don’t need to worry about burning your hands or bother with bulky mitts while handling it. It has a useful little detachable electronic cook timer with a 99 minute limit. The ash catcher tray and the vents are made from rust proof aluminum. The total cooking area is around 363 square inches, making it a decent sized grill. But what really makes this grill amazing is the gas based push button ignition system for lighting up the charcoal. 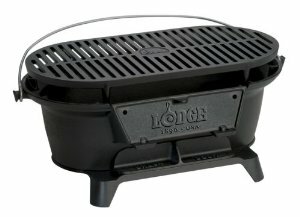 For someone who is new to grills and wants a hassle free charcoal grill, this is the way to go. And all these features are available at a price of just three hundred and fifty bucks. 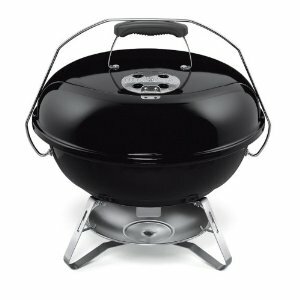 The Weber Jumbo Joe Gold Charcoal Grill is a relatively small grill aimed at those on a tight budget. 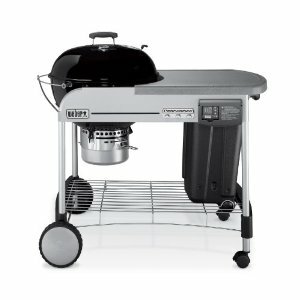 However despite being a budget charcoal grill, it does not lack in quality or features and continues Weber’s tradition of good, solid grills for home use. The lid handle as always is made from glass reinforced nylon for easy handling. The entire outer surface of the pot and the lid are enamel coated giving the grill a smooth finish. The ash catcher and the dampers are made of good quality rust proof aluminum, same as the ones found in higher priced Weber models. The entire grill is compact and weighs less than 20 pounds, and is perfect for apartment dwellers who cannot afford the space occupied by the larger more expensive grills. And despite the fact that the grill is small and relatively light, it is build to be sturdy and solid and you never need to worry about it tipping over. All in all, this is one low budget, high performance, and compact little grill, well worth its sixty dollar price tag. 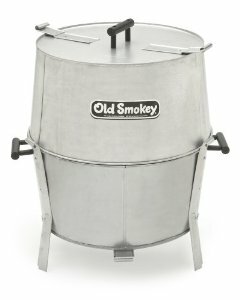 That reason is that Old Smokey has a simple time tested design that has served its users well over the years. The grill is lightweight at around 19 pounds, but sturdy all the same. It is made out of aluminized steel giving the body strength while making is rust proof at the same time. The total cooking area is 345 square inch, which is good for a grill belonging to this price and weight range. And all this is available for a price of just sixty five dollars. The one flaw in this grill, which in all honesty is no deal breaker, is that the cooking grate stands about 14 inches from the ground in standard configuration, so using it while placed on the ground would require a little care, and some bit of bending over. This can simply be over come by placing it on a raised platform of some sort, perhaps a foot high. The bottom line is that this grill is one of the simplest and cheapest grills out there and certainly worth its low cost. This is a bare bones, no nonsense grill that screams masculinity. To begin with, it is made of cast iron in its entirety, including the grate. The cooking area is around 155 square inch. The cast iron material means that while the grate will take longer to heat up relative to steel or aluminum grates, it retains heat far longer than either of those two materials can. The entire thing weights around 27 pounds, which is a little on the heavier side and it also sits low on its stand. While this makes it sturdy, it also means that carrying it around is not all that easy (making it a man’s grill) and the low ground clearance means that keeping it on wood or grass is not advisable. It is best to use this grill on a brick or concrete surface or something similar. The cooking is controlled by adjusting the height of the grate; there are two levels to adjust it to. The overall size is quite small considering what it weighs. The dimensions are 19×10-1/4×8-1/4 inch, making it very compact and useful for apartment dwellers. The price of the grill is around sixty two dollars. All in all this is a sturdy little grill, perfect for people who don’t need any extra bells and whistles on their grill and need a simple, sturdy and compact model for home use. Now that we have gone through the basics of what a charcoal grill is, how to pick a charcoal grill suited to your needs and a list of the top five charcoal grills out there, it is in the end for you to decide as to what suits your needs best. Consider your price range, your requirements and the space where you intend to use the grill. Once you are certain purchase a grill and start cooking!